Using 2 arches plus connector will make up Wicker Gazebo. 13 pcs total. 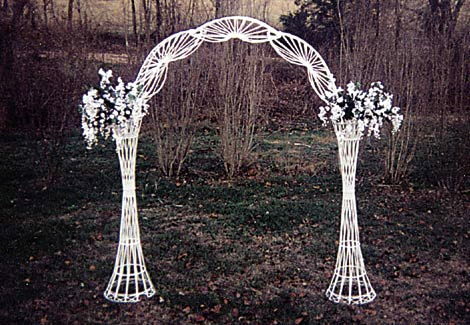 This lovely wicker look arch is adjustable up to 8'h x 8'w. It can hold 2 potted plants or flower arrangements, can be decorated with flower or vine garlands, tulle, lights or anything else you can dream up to make your wedding ceremony extra special! * Please call us for any questions on our arch wicker rentals in Pipersville PA, Hatfield PA, and Bucks & Montgomery Counties in Pennsylvania.